Earthworks are some of the easiest, least expensive, and most effective ways of passively harvesting and conserving multiple sources of water in the soil. Associated vegetation then pumps the harvested water back out in the form of beauty, food, shelter, wildlife habitat, and passive heating & cooling strategies, while controlling erosion, increasing soil fertility, reducing downstream flooding, and improving the quality of the water and air. 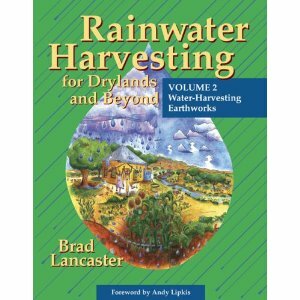 Building on the information presented in Volume 1, this book shows you how to select, place, size, construct, and plant your chosen water-harvesting earthworks. It presents detailed how-to information and variations of a diverse array of earthworks, including chapters on mulch, vegetation, and greywater recycling so you can customize the techniques to the unique requirements of your site. How curb cuts redirect street runoff to passively irrigate flourishing shade trees planted along the street.